NB that the Sarah Williams whose birth is registered in March 1841 in Abergavenny (v.26, p.16) is the wrong one (I have a copy of the birth certificate). Most probably the Sarah Ann Williams birth recorded in Hereford district in the March quarter of 1841 (v. 26, p. 169). The middle name is problematic, but Hereford is the expected registration district for a birth in Longtown or Llanveynoe. According to Maureen Farrimond: 'Sarah Williams was baptised on 21st March 1841 in Longtown'. Recorded in the 1841 census for Llanveynoe, aged 5 months. Also in the 1851 census for Llanveynoe, aged 10, where she is descibed as daughter and housekeeper. Born in Llanveynoe. 1861 census: living in Llanveynoe with father, sister, brother-in-law, niece, and nephew. Age is 20, and place of birth is Llanveynoe. 1863: At daughter Catherine's baptism she is living at 'Derry' (i.e. the Deri). 1871 census: living with husband and children at Balls Cross Cottage, Rowlstone. Age is 28, and place of birth is Clodock. 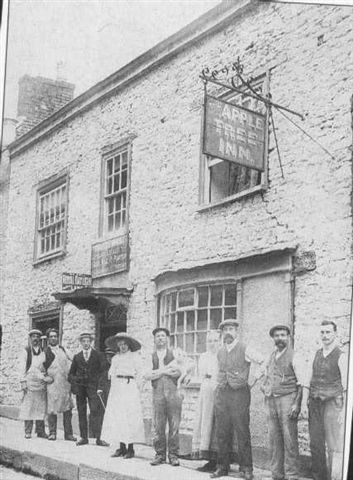 1891 census: living with husband and children at the Lamb and Flag Inn, Llanwenarth Citra. Age is 48, and place of birth is Clodock. 1901 census: living with husband and son at 43 St Helen's Road. Age is 58 and place of birth is Clodock. The death of a Sarah Davies is recorded in the Family Bible as 'Nov. 11 1912'. Probably the Sarah Davies whose death aged 70 was registered in Abergavenny district in the December quarter of 1912 (11a58).